In part one of this series, you read about INFJs’ Ni-driven gifts, and, in part two, you learned about Fe-driven strengths. But now these questions still need to be answered: How do the two cognitive functions work together? And what are your Ni-Fe-driven gifts? In this article, number three in the INFJ Superpowers series, we’ll examine several abilities that are the products of introverted intuition (Ni) and extroverted feeling (Fe) synergizing. Read on to learn how your top two cognitive functions work together to give you your Ni-Fe-Driven gifts. As we saw earlier, introverted intuition (Ni) is an information-seeking, future-oriented, creativity-filled function, whereas extroverted feeling is primarily concerned with promoting harmony in groups, caring for others, and persuading people for their good. Together, the functions pursue and accomplish the same basic goals, but each function impacts just how the other does so. More specifically, if you can imagine Ni as a motor driving your personality, then think of Fe as the steering wheel or rudder giving it direction. For example, most INFJs’ learning, imagining, planning, and theorizing is intended to help people as opposed to accomplishing impersonal projects and tasks. The flipside is somewhat true as well. When INFJs seek to help others via Fe, they tend to do so out of their natural gifting and interests: they revert back to their big-picture thinking gifts, ability to synthesize and communicate ideas, vision-casting, and so on. So, in effect, Ni directly impacts just how INFJs use their Fe. In the following gifts, you should see both functions at work. It’s also worth noting here that all of the gifts I’ve shared in the previous two articles are the result of Ni and Fe working together to some extent. This is because your INFJ personality is dynamic: it’s almost impossible for you, or any INFJ, to operate out of one function alone. The others impact your thoughts and actions too, even if only minimally. Almost all INFJs have an incredible ability to put themselves in other people’s shoes. Similarly to how they’re able to think about their own thinking, they can, to a lesser degree, think about what other people are thinking. There are two major reasons for this. When I spend time with my wife when she’s feeling discouraged, for instance, I frequently end up feeling down too – even if I was just in great spirits. INFJs usually do this even without trying. Second, many INFJs spend a lot of time trying to observe, analyze, and understand what goes on in other people’s minds. They’re natural people-watchers and unofficial psychologists. They want to know what motivates others, and they’re good at figuring it out. What they learn, in turn, helps them relate to all kinds of people. The downside of having a solid understanding of others’ thoughts and motivations, though, is that you want the same from others. You want them to “get you” and appreciate you. But fortunately or unfortunately, most people don’t understand what’s going on inside an INFJ’s head. An ability that flows out of INFJs’ understanding of others and their tendency to promote group harmony is team building. They naturally see the gifts in others and strive to help teams make the most of each member’s superpowers. When there’s friction in the group, they also help teammates understand and appreciate each others’ unique and valuable perspectives. Additionally, because Fe is INFJs’ primary way of relating to the world and expressing thoughts and ideas, most INFJs get a lot of joy out of helping a team grow and work more efficiently. When a group accomplishes something important together as a result of an INFJ’s work with them, the INFJ feels quite satisfied. Postured toward the future and striving to understand others’ passions and abilities, INFJs are in a unique position to see and celebrate potential in others. They recognize what’s possible for people and strive to help them make their dreams a reality. Some of the people who’ve made the biggest difference in my life are the ones who recognized my dreams, affirmed my gifts, and inspired me to “go for it.” A few teachers, for instance, told me I was a good writer and challenged me to write. In doing so, they filled me with joy and courage and affected me in a deep way. You and I, as INFJs, have the extraordinary privilege of giving people the vote of confidence they need to become who they were made to be because we see what they’re capable of. Emotional intelligence has received more attention and weight in recent years. Most people value intelligence, but they also intuitively understand that, without people skills, it’s not enough to be “smart.” Fortunately, most INFJs have a high E.Q. They can sense the effect their words are having on other people, and they know when to be sensitive and vulnerable. 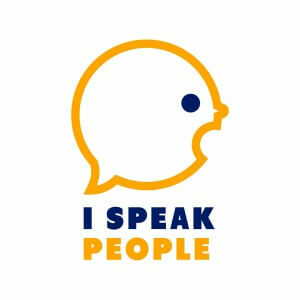 INFJs connect with people – all kinds of people – like no one else. This is a big reason why they make great listeners, advisors, and counselors. It’s also a reason why INFJs can excel at online networking. Finally, INFJs can usually tell when other people are being inauthentic, to varying degrees. To be clear, INFJ can’t read people’s minds, but they generally know right away when someone isn’t fine – even he or she claims to be. Again, I can sense this in my wife. When she’d rather sweep her feelings under the rug or ignore them to avoid conflict, I can’t help but sense the tension and want to make amends. So I call her on her bluff, which tends to be better for our relationship, most of the time. 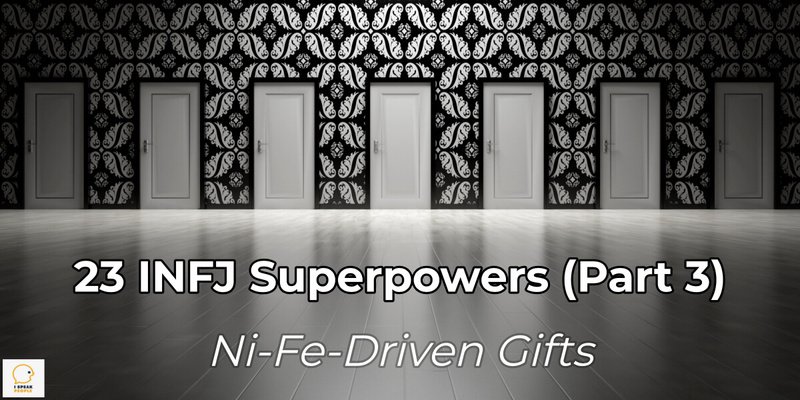 Ni and Fe are truly a dynamic duo in your INFJ personality. You would be wise to identify and hone these much-needed gifts. The world needs what you have to offer. As with the previous articles, this list is not exhaustive, so please add your own thoughts in the comments.